Here it is the first day of February and this is my first post of 2015. Already second guessing that new year’s resolution to be more committed to keeping everyone updated with my blog! 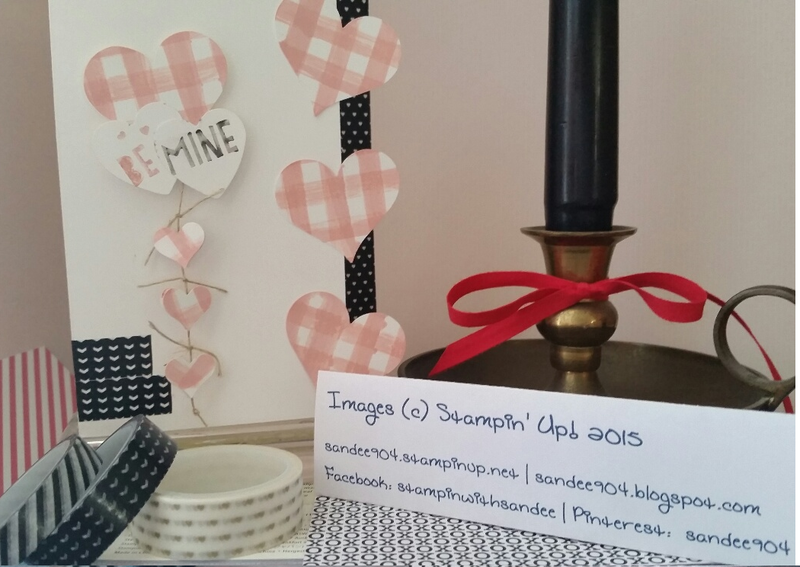 Leave me a comment and let me know your paper crafting interests. January club was held on Saturday the 17th. It was so good to see everyone and hear about their holidays. We have a new club member, a recent transplant to the area who found us through Stampin’ Up. She is tried and true Stampin’ Up! She is a great addition to our group. In addition to birthday cards, our focus was on Valentine’s day cards since February club falls on the Saturday after Valentine’s day. Here’s a picture of one of the two Valentine’s day cards we made. The “Be Mine” sentiment is from the You Plus Me Stamp Set, I broke up the sentiment on two hearts punched from the smallest heart die in the Hearts Collection, and the tail of hearts are from the “scraps” of the handmade gingham DSP punched with the small heart in the Itty Bitty Punch Pak linked using Linen Thread, with small pieces of Linen Thread tied in a simple knot between each. I don’t think you can tell from the photo, but the Linen Thread is run between two hearts back-to-back using simply Snail Adhesive (I didn’t want to deal with excess glue on the small hearts). Just a couple of strips of coordinating Stacked with Love Designer Washi Tape for the finishing touch. I will share another Valentine’s day card soon so that you have a couple of options.